The Arts Society Fylde’s Heritage Group Project Stitched Together: Strands in the Sands – The Fylde Coast have arranged a visit to view the Heritage Mural at St Annes Parish Church, St Annes, on 20 June at 1.45 pm. 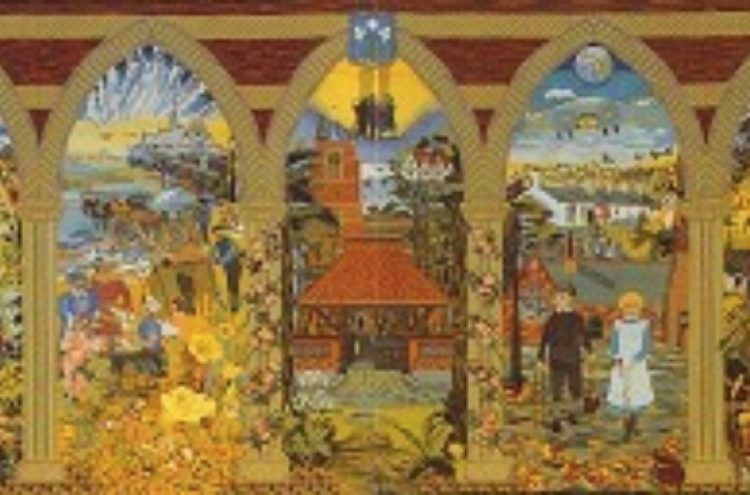 The Mothers Union will give a talk about the Mural, which is a giant tapestry, embroidered by the Church Broderers in the 1990s, and which shows places and events of note in the history of St Annes-on-Sea and its church. The Mural has won several awards, is 18ft long, 6ft 5in high and contains 2,166,528 stitches. It comprises seven individual panels, each depicting various aspects of the life and times of St Annes-on-Sea. Embroidering began in April 1989 and took almost seven years to complete.